It’s time to reach for the sky… and then film yourself falling from it. That’s GoPro’s approach to marketing, and it’s worked tremendously well. 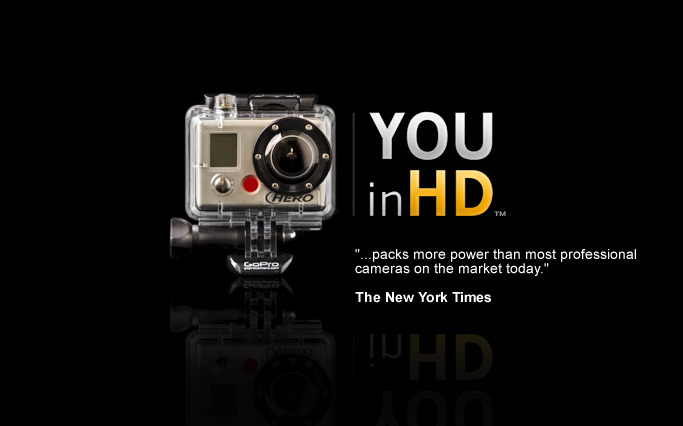 In late 2012, the hip surfer cultured company released their newest product, an action video for adrenaline junkies called the GoPro Hero3. Amazingly, their only forms of marketing came from a single promotional video. And guess how many times that video explicitly featured their product? 2 times! Yet the video accumulated nearly 8 million views only a few months after its debut. So how did a company attract so much attention with just a single YouTube product announcement? Let’s take a look at three of GoPro techniques’s that you can use to leverage content and create your own viral marketing success. The word “content marketing” gets thrown around a lot; but it’s clear the focus isn’t always understood. Internet marketers and SEOs seem to put a lot of emphasis on leveraging content for the sole purpose of gaining links. But the benefits are significantly greater when you focus your end goal on people. In the end, it’s the PEOPLE that keep coming back to buy your product, not Google’s crawlers or the linking domains. Therefore, it’s a no brainer that you should try to build content that creates an emotional connection with potential viewers. 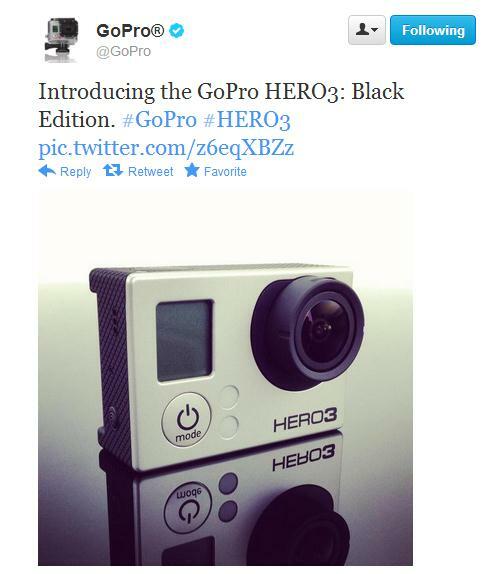 For GoPro, they focused their content marketing strategy around the people. Their strategy didn’t include touting their camera’s features or offering discounts to build a following. All they had to do was focus on inspiring the dreamer within everyone. And they executed it perfectly by creating something truly engaging to their customers. The combination of stunning cinematography and the awe-inspiring feats cultivate the intangible. They inspire a loyalty and emotional appeal to the brand that goes far beyond price points and extra features. You can’t run a successful campaign without an audience, and you can be sure that you won’t pull on any heartstrings if no one is listening. So it’s essential that you focus on connecting and building relationships with your target market long before any product launches. This goes for your brand too. To put this in perspective, GoPro managed to launch a product solely with viral hype, social buzz, and a well thought out YouTube video. No fancy marketing software necessary. But what did it use as leverage? A well connected audience. This innovative company has 1.8 million YouTube subscribers as of April 2014. It also has more than 930,000 followers on Twitter, and 7 million likes on Facebook. Their interactions on Facebook usually span from a minimum of 1,500 likes to over 11,000! GoPro can attribute this social success to not only successfully engaging with their audience, but by letting them become a part of the conversation. In brilliant fashion, GoPro hardly ever has to create their own content; rather, they have their users submit their own video’s and adventures, which they post on a daily basis. This strategy capitalizes on our inherent desire to share our adventures through social media, all the while creating compelling content for the brand, as well as allowing an avenue for us to brag about it! 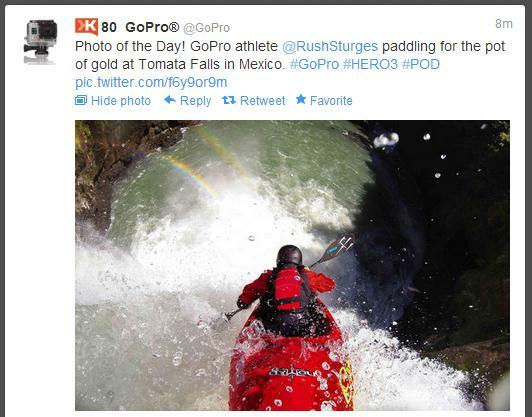 And here’s a photo shared on GoPro’s Twitter feed, again submitted by a user (in this case an athlete). Sometimes, consistency is the key to success. GoPro chose a strategy and stuck to it with the months leading up to their product launch. 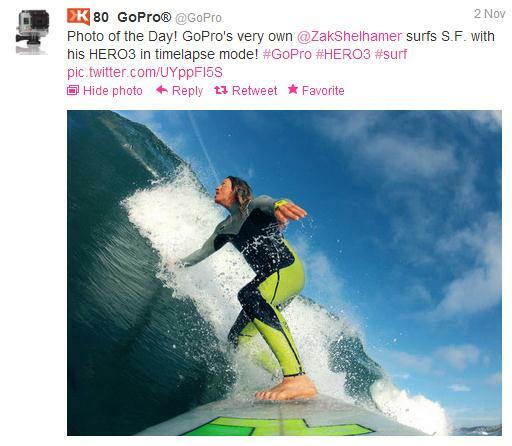 They created a lot of buzz for their Hero3 release by utilizing consistent social media tactics built around the brand. They did this by posting a series of images on their social accounts consisting of influencers and athletes using the product. It created a lot of hype among their followers and introduced a symbol that allowed their fan base to keep up with the product. In summary, GoPro made their success with their content marketing by branding themselves in a way that was interesting and extremely share-worthy. They created an emotional appeal by sharing content that was interesting, built up their audience by allowing their customers to be part of — or even drive — their conversations, and they were both reliable and consistent in sharing daily photos and videos. This user-focused approach is what made the launch of the Hero3 so successful, and what helps GoPro stay in the spotlight even now. By following these three measures for branding success, you can leverage your own social powers, and word of mouth to create your brand’s own viral marketing success. You have the tools, now you just need to use them! Brand your own product in this same way and it’s likely that you too will find success with your content marketing.